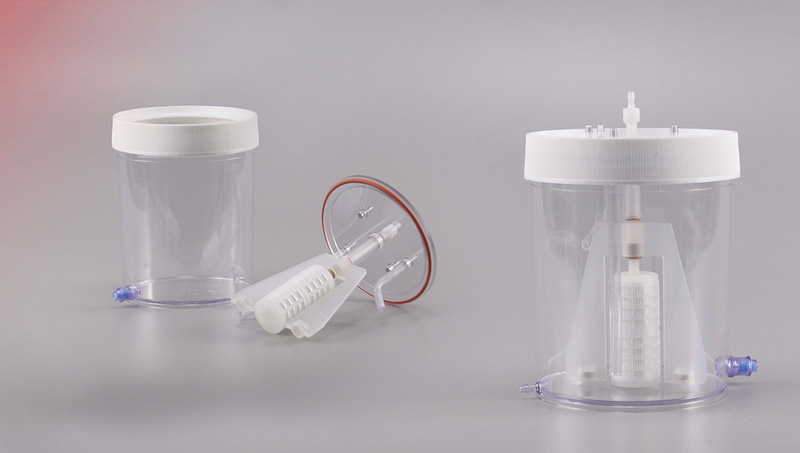 The Cell Separation Continuous Perfusion System is a stationary filter element with a rotating magnetically driven agitator... think inside-out spin filter... that can be used for perfusion media exchange and potentially other applications. Cell culture is pumped from the bioreactor through the Perfusion System and is returned to the reactor, while a permeate stream is pulled off through the filter. The system is completely configurable in terms of filter media, agitator speed, diptube and sample port locations and would be supplied closed and irradiated. Sizes NOW are 1L & 2L… more sizes planned. Top fitting options: hose barbs, Min i or 1-1/2″TC, luer fittings, Quick Connect, threaded, etc.